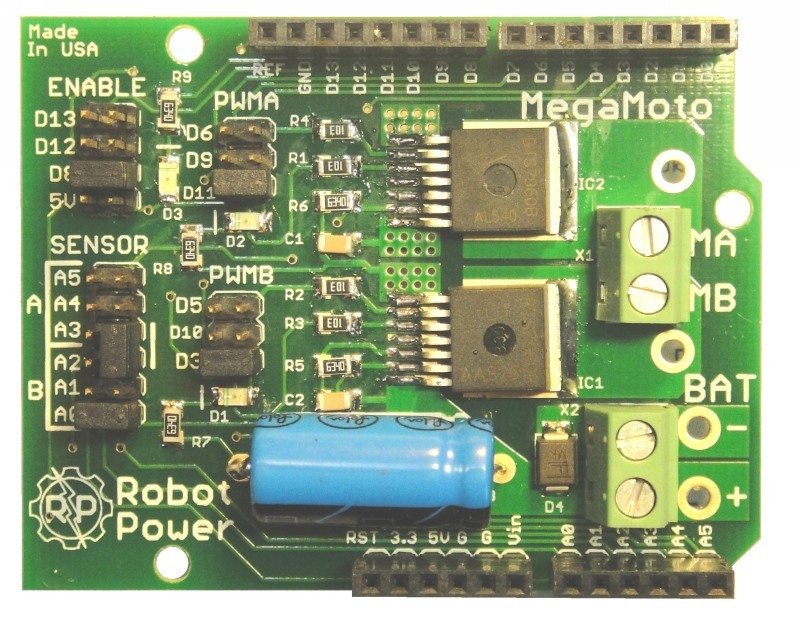 The Robot Power MegaMotoTM is a low-cost robust H-bridge "shield" for the ArduinoTM and hardware compatible base units. The standardized shield format stacking headers allows multiple MegaMoto units to be controlled by a single Arduino Uno or Duemilanove using pass-through stacking headers. The MegaMoto is the first and only motor control for Arduino that gives users the ability to control up to 30A of current at up to 28V. That's over 800W of power! At last Arduino users can easily control high-current, high-power motors for robotics, scooters & Segways, industrial controls and many other applications by using their familiar development environment and without messy, unreliable "lash up" type connections to discrete motor controls. The MegaMoto is a dual half-bridge circuit that can be configured either has a full H-bridge or as two independent half-bridge circuits. This allows a single MegaMoto to drive one motor with full variable-speed control both forward and reverse. It also allows two independent motors	to be controlled in a uni-directional fashion by connecting one side of each motor to the battery negative and the other motor lead to one of the MegaMoto outputs. 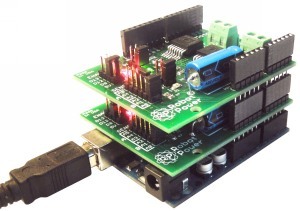 The true flexibility of the MegaMoto is shown when multiple units are stacked onto a single base Arduino unit. Jumpers are used to select which Arduino signals drive the Enable and PWM inputs on each MegaMoto. This flexibility allows the MegaMoto to play nice with other shields which might require the use of certain pins. Since the Uno and Duemilanove have six hardware PWM outputs, up to three MegaMoto units may be stacked on a single Arduino base unit. This allows forward and reverse control of up to three motors or up to six motors in half-bridge mode. Arduino Mega and some units based on other CPU chips have more PWM outputs available and thus may be able to control even more MegaMotos. Each half-bridge on the MegaMoto is independently controlled so stacking two or three MegaMoto units allows an Arduino to drive three-phase brushless or stepper motors as well as DC brushed motors. Not limited to motors, the MegaMoto can control other DC loads such as lights, solenoids, relays, valves, Peltier junction coolers, Hydrogen generators or basically any DC device within the operating voltage and current range. A User Manual and Schematic diagram are available for more detailed information. 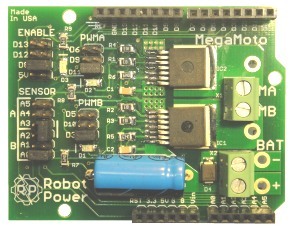 Robot Power offers the MegaMoto fully assembled and tested. Check the Web store for details on prices and special offers.